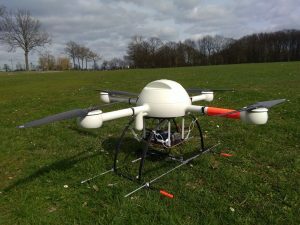 Last week we conducted first flights with a new equipment for the survey of wild animals. In the long term the goal will be a system that can assist in locating individuals equipped with telemetry transmitters. The material was prepared and assembled in the context of a bachelor project in the the institute of landscape ecology. 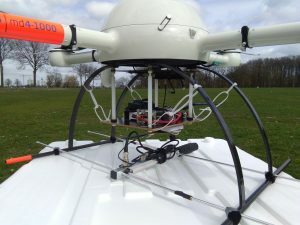 In this project it is planned to use the drone as an intermediate station for telemetry signals of animal tramsmitters. The signals are received with a RTL-SDR-dongle and are forwarded to a ground station, where they are reconverted to audio signals. There a surveying person might use them to locate an animal via auditorially sensed signal strengths. 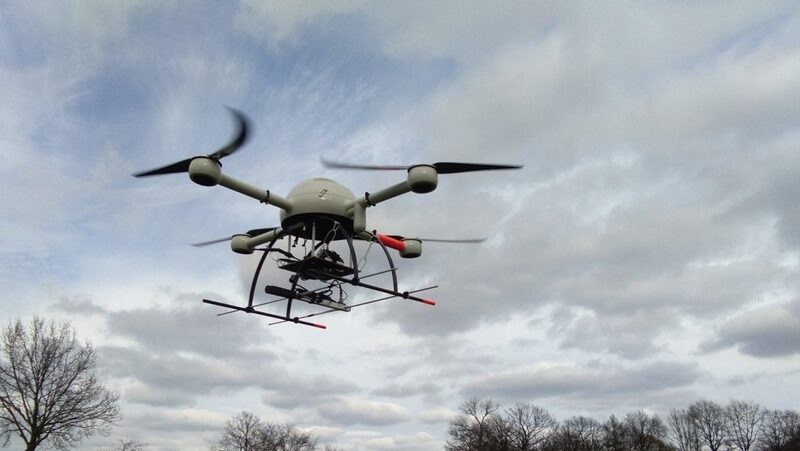 The test flights with the quadcopter MD4-1000 showed that the, in some parts quite bulky equipment, had no considerable impact on either drone system or flight characteristics. It consisted of a Raspberry Pi computer and several other small hardware parts mounted on a platform under the quadcopter and a H-antenna attached to the landing skids.